Uridium is a game designed by legendary Commodore 64 designer Andrew Braybrook at Graftgold. The game focuses on the story of large space craft called Dreadnaughts (imagine the Death Star from Star Wars), who are attacking the solar system. Your job is to land your highly movable space fighter on each of the Dreadnaughts and destroy the Dreadnaught from within using fuel rods. However before this, you need to neutralise the Dreadnaught’s defenses. This game is a side scrolling shooter, and have two unique selling points. First of all it’s unlike any side scroller in that it shifts at a fair pace. Seriously, very few Commodore 64 shift as fast as this game, it is quick, and what the programmers at Graftgold achieved – under limitations – is very, very impressive. It’s quick, and allows for a high amount of maneuverability. A lot of the critic plaudits of the game is because of the graphics and the way they move. It would not look out of place on a Super Nintendo. It’s that quick, and it makes for an action packed game. The other thing that this game offers is a very, very, very steep difficulty curve. When reviewing this game after not playing it for a number of years, I struggled to get off the first level. It is a tough game, and even landing on some of the later levels (which are all named after metallic elements – upto “Uridium”, the final level) is tricky, as you have to learn to fly your fighter on it’s side through miniscule gaps in a Star Wars Episode 1 Pod Racing Stylee. The controls are completely rock solid, but it’s still a tough nut to crack. So is it worth playing? Well, if you’re a fan of shoot em ups, you’ll either love or hate it. 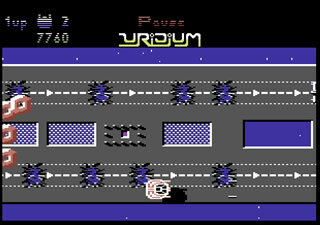 Whilst there are a few side scrolling shoot em ups have given you an option to fly “the other way” as freely and effortlessly as this (such as Thunderbolt, Poltergeist, Mama Llama), Uridium always sticks in my head as being probably the most famous. It is quick, fast paced, exhilarating and a well polished shooter. On the other hand, it is tricky. You seemingly die fairly regularly to begin with. The other thing is that the levels are practically the same. The dreadnaughts are more functional than imposing, and the music and sound effects are instantly forgettable. Paradroid – one of Braybrook’s earlier games – achieved more atmosphere with it’s random computer noises. In this game, they are just there. I guess for us retro gamers who know their salt it’s unfortunate. Graftgold’s games will always be compared to the masterpieces like Paradroid and Gribbly’s Day Out. But if you fancy a fun shoot em up for the Wii for an evening, then this is a good game to play. 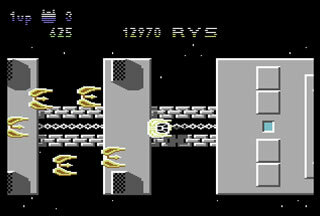 My favorite C64 game of all time…thanks for the fond memories.